Today I am asking you to mark the dates and confirm that you are interested in more information! Best registration rates are before April 7, but all rates are always super inexpensive! We have had nine previous great conferences, but let me be brutally honest, "We need your leadership and the black community needs your leadership at this conference & retreat, as we celebrate 10 years of building a think tank and movement!" You do not have to be an officer in an organization to be considered a leader; but just someone making a difference for people of various ethnicities! This is your personal invitation to a very special African-American leaders conference & retreat...from me, Keith Orlando Hilton. Bring a friend or two, or your family! This small, exclusive, annual conference is open to no more than 100 people (and their families and guests)! First of all, please confirm that you received this and that you might be interested in participating. This is a great networking conference; you can possibly earn CEUs; you could leave with consulting skills that could also mean extra income; you will acquire additional leadership and management skills; you will definitely continue to make a difference (and if you are a scholar, this is an opportunity to present and possibly get a publication or two)! 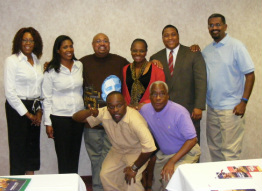 If you are viewing this, it means that you are a leader or decision-maker making a big difference for African-Americans locally or nationally, or people of African descent worldwide. You might even be a friend or a friend of a friend or a Roanoker or a former classmate or a colleague or family member of KOH! Whatever the connection, you are invited!. 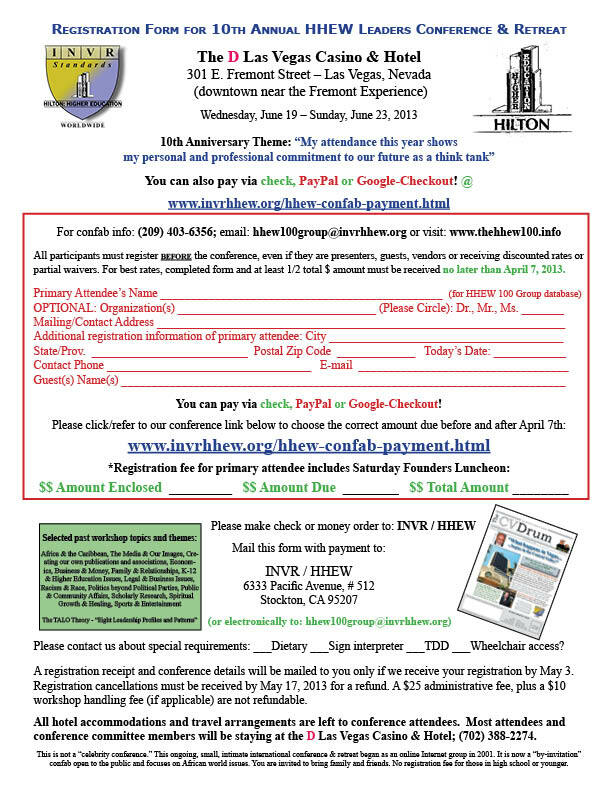 Please join us in Las Vegas from June 19 – 23, 2013 at the 10th Annual HHEW Leaders Conference & Retreat. This is one of the least expensive get-aways you can find. We focus on community issues, education, K-12, legal matters, money management, Africa, the Caribbean, relationships, jobs & careers, politics, racism, religion, etc. But we don't just talk about these and other issues, we put our heads together and discuss solutions. I have included a few other important links below that will also help get you with registration. Registration is now open. If you have any questions, please let us know via email (hhew100group@invrhhew.org). Thanks.